A Durham based glass company has completed a £2.8m relocation, doubling the size of the space it occupies. Family business Peterlee Glass, which this year celebrates its 40th birthday, has moved into a state of the art, 60,000 sq ft facility in Peterlee. The company, which was acquired by Brownhills Investment Group in 2015, has brought together its office and production facilities and trade centre into one building. The move comes after the company, which was founded by late businessman David Hawes in 1977 and is now headed up by his son Graeme, underwent a period of significant expansion in 2016, adding new contracts to its portfolio and increasing its workforce to 34. The move has been supported by Brownhills’ banking partner Lloyds Banking Group, who supported Peterlee Glass with the purchase of new machinery, while the site’s landlord invested £1.3m on the refurbishment of the building. Managing Director Graeme Hawes said: “We have been planning this move for some time as we simply couldn’t grow any more in our existing premises. “The new site has doubled the size of the space we occupy and means we are now in a position to take the business into the next phase of growth. “The key thing for us is that alongside the additional space we now have available, we have also invested heavily in new machinery, two major new additions to our equipment portfolio which means we can work with much larger sizes of glass. “This is going to prove a significant asset to us as these machines are the largest at any glass company in the north and strengthen our ability to bid for bigger contracts as the demand for larger glass products is far greater now. 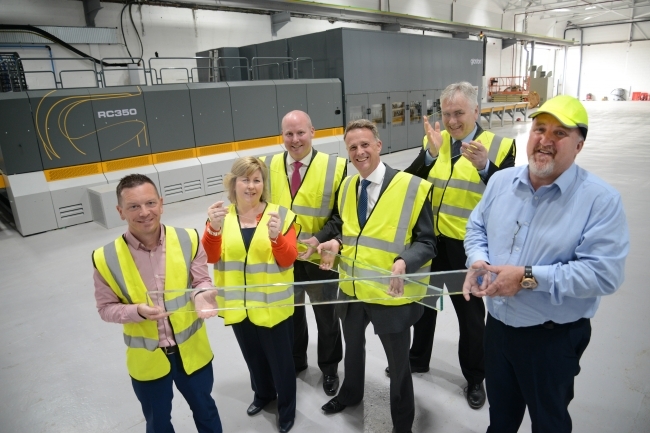 Lesley Williams, regional manager for Global Transaction Banking at Lloyds Bank, said: “The growth of PLG Glass has been phenomenal over the past three years, and moving to a new premises with more efficient machinery will help the company to continue to capitalise on new opportunities. Peterlee Glass produces architectural glass panels for use in balustrading, canopies, stairs and structural glass installations, mirrors and safety glass to customers including Fenwicks, Primark, TK Maxx, Next and Selfridges. Its trade centre supplies and installs glass for kitchens, bathrooms and various uses around the home. The company has also supplied glass panels to the Metro Centre, Eldon Square, the British Museum and the Sage Gateshead and has worked on projects as far afield as Europe, the USA and United Arab Emirates.